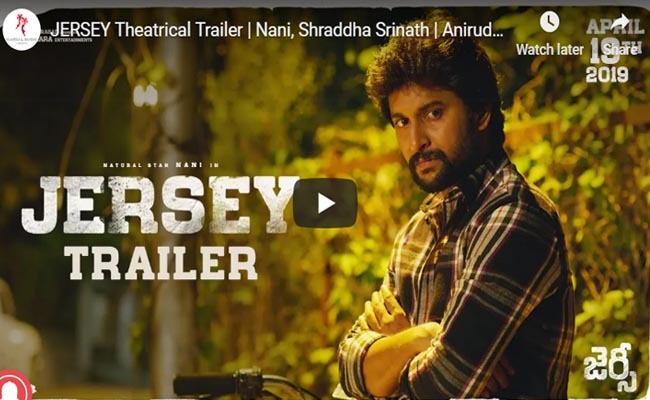 The trailer of Nani starrer Jersey has hit the media. All gearing up to release in this summer, fans have found the trailer to be quite impressive. The trailer suggested that Natural Star is surely going to have yet another superhit. Apart from the performance of star cast, what made the trailer looked impressive, was that of Anirudh’s background music and the mindblowing visuals captured by Sanu Varghese. Directed by Gowtham Tinnanuri, Jersey deals with the life of a cricketer, who lost his place from the cricket team. Panned to some ten years down the lane, the cricketer was caught by police for stealing his wife’s money. Now, divulging further, the trailer suggested that he would be trying to reenter the cricket team. With the presence of all the required emotional quotient and engaging moments, Jersey trailer has impressed the audience in big time.